Last week the CyArk offices received a visit from San Francisco Chronicle Staff Writer Tom Abate. Mr. Abate is a Science and Technology writer for the Chronicle and was particularly interested in the mechanics behind the laser scanner and the innovations taking place at CyArk today. This visit resulted in an article on the front page of Sunday’s Business section. 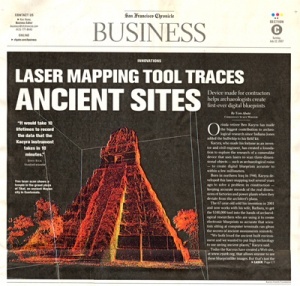 The article focuses on the history of CyArk founder Ben Kacyra, from the invention of the laser scanner to its applications within cultural heritage. To read the full article view the external link.